Have you ever felt hatred? Hatred that soaked into your bones? Hatred that snatched your breath and your self-worth. Hatred that bowed your posture and made you feel unworthy of an ounce of respect or honor or love? What about hatred that weeps insincerely when caught? While finishing up this series on Leviathan, I have envisioned being right there with David, living in caves, rocks, and strongholds. Running with his motley crew of warriors, all 600 of them. I felt the adrenaline of an army encircling him like a pack of wolves. His predator is a man soaked in Fear, Jealousy, and Rage. Leviathan has formed a vortex and its headed straight at the Father’s chosen king—the son of Jesse. As we look through our telescopic device, zooming in closer to this man David, I believe we can learn numerous things about our own character and our hearts. This is much needed during the ten days —a time of repentance before the Most Holy Day, Yom Kippur. We often look forward to the season of joy, Sukkot. But true joy doesn’t come from a nice stroll through the park or a beautiful home, a cushy career, a new lover, etc. Joy comes after much pain and suffering. The poet, David will pierce us with his words in this piece, and his words and actions will pierce leviathan the twisted sea serpent. David is a man who has been running for his life from one man, his father-n-law, who happens to be the King. David is now about to ask the Father a question. The question has nothing to do with pride or self-seeking or even when he will see victory. The question has nothing to do with Saul or when he will be free from being hunted as prey. He doesn’t ask when he will be exalted as King and rule over Israel. David’s heart is for the people. He is a poet–yes, but he is also a warrior! “Blessed be the LORD, my rock, Who trains my hands for war, And my fingers for battle;” (Psalm 144:1 NASB). David becomes aware of the Philistines stealing from the threshing floors, and he seeks HaShem for answers. So David inquired of the LORD, saying, “Shall I go and attack these Philistines?” And the LORD said to David, “Go and attack the Philistines and deliver Keilah” (1 Samuel 23:1-2 NASB). David doesn’t say “I’m going to the enemy’s camp and taking what was stolen from the threshing floors!” He says, “Shall I go and attack?” Wisdom here. Even after his men fear and try and steer him from attacking the Philistines, He doesn’t say, “I know what God said! And you better listen to me because I hear from the Father!” Nope. This humble man does something different. . .
“But David’s men said to him, “Behold, we are afraid here in Judah. How much more than if we go to Keilah against the ranks of the Philistines?” Then David inquired of the LORD once more. And the LORD answered him and said, “Arise, go down to Keilah, for I will give the Philistines into your hand” (1st Samuel 23:3-4). In this portion, there are two things that break my heart and multiple lessons for all of us during this season. 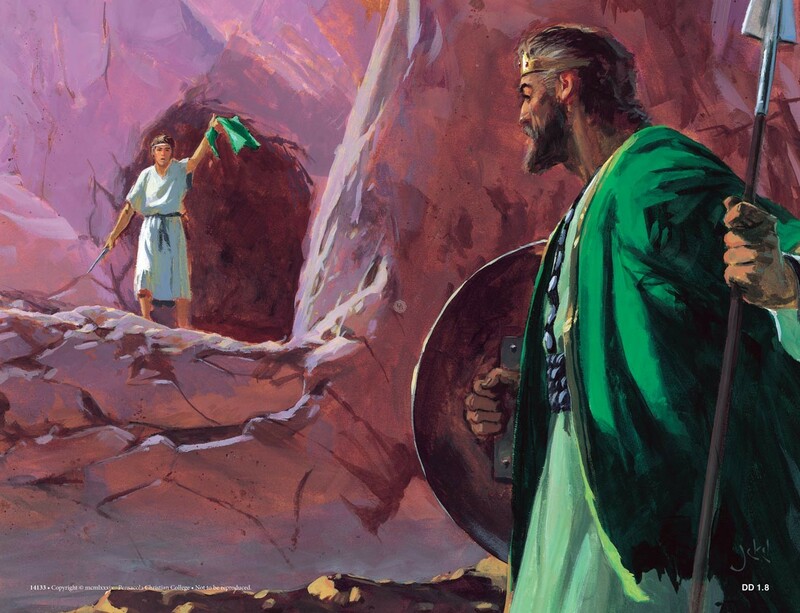 After David battles the Philistines and defeats them for the people of Keilah, Saul hears of it. Most of us would hope that if we fought for people, just as David did, that those we fought for would protect us, but we, like David, see something else at times– we see the opposite. How many people have come to us and asked for help, prayers, monies, counsel, and our time and talents and we have poured out, but when we were in dire straits, they sold us out. How many times have we done the same? The second heartbreaking passage is about Saul. We see a King, anointed by Samuel that is so far off from knowing the condition of his heart; he still thinks the Father is with him and for him. How many of us have been in this situation? Let’s look at this carefully. “When it was told Saul that David had come to Keilah, Saul said, “God has delivered him into my hand, for he shut himself in by entering a city with double gates and bars.” So Saul summoned all the people for war, to go down to Keilah to besiege David and his men” (1 Samuel 23:7-8, NASB). Saul thinks the Father considers David to be an enemy because he sees him as one. He looks at David with a stink eye. He believes in his heart that the Father is on his side. How deceived he is. How deceived we all can be at times. Who do we see as our enemy? And the people David just fought for and delivered, they will not even shelter him. “Then David said, “Will the men of Keilah surrender me and my men into the hand of Saul?” And the LORD said, “They will surrender you.” David stayed in the wilderness in the strongholds and remained in the hill country in the wilderness of Ziph. And Saul sought him every day, but God did not deliver him into his hand” (1 Samuel 23:12, 14, NASB). The text says, “And Saul sought him every day.’ Every day our enemies may be out to seek our destruction. They may be bent on destroying us with their tongues—destroying our character and speaking lies and gossip. They may point fingers and dig up our past and our mistakes. They may have gathered a whole army to hunt us down, but David exclaimed over and over again that His God was his Rock. We just left Knoxville Tennessee on Monday. While driving through, we saw many amazing rocks and mountainous formations. White Smokey clouds clung to the tops of these majestic structures. These mountains are firm foundations you can stand on. Immovable. We too are living stones. David was hidden in the cleft of the rock. His Father was a fortress and a shield, a very present help in time of need. We will look at this rock shortly and one reason why David used a rock to describe Adonai’s protection. Matter a fact, David’s last words before his death declared that the Rock of Israel spoke to him. And He did. David, the poet, shot arrows from his quiver that still pierce our hearts and souls due to the descriptions he used that magnify Adonai and capture the adoration of the work of His Hands. We read about a God that is personal and with us in our darkest moments and our most horrific trials. A God that hides us in the Rock. After learning that the people of Keilah and Ziph (Refining Place) will give him into the hands of Saul, he writes a Psalms in chapter 54 explaining his troubles and his faith in One mightier than men. When Saul and his men went to seek him, they told David, and he came down to the rock and stayed in the wilderness of Maon. And when Saul heard it, he pursued David in the wilderness of Maon (A refuge). 26Saul went on one side of the mountain, and David and his men on the other side of the mountain; and David was hurrying to get away from Saul, for Saul and his men were surrounding David and his men to seize them. 27But a messenger came to Saul, saying, “Hurry and come, for the Philistines have made a raid on the land.” 28So Saul returned from pursuing David and went to meet the Philistines; therefore they called that place the Rock of Escape. 29David went up from there and stayed in the strongholds of Engedi. The Rock of escape—According to Abarim Publications, “ The name Sela-hammahlekoth occurs only once in the Bible. It’s the name of large rock or small mountain in the Arabah that David managed to keep between him and Saul, when the latter was hunting him. David leaves there and travels to a place called Engedi—a strong hold in the rocks that is also a place that means springs of water. I found a fantastic blog by David Whiting with photographs of this area of Engedi that depicts beautiful waterfalls next to the cliffs and steep mountains. Click HERE to view photos of where David was hiding and read a beautiful message as well. Can you picture the scene? David and his rough wilderness men are sitting in the cave when the man who is hunting them down comes in to take a leak. Excuse me, relieve himself. His back is to David, and his men say look bro, the God of Abraham, Isaac, and Jacob has given you your enemy. Take him out! David didn’t fear Saul because he was tall and robust and had 3,000 men with him. He feared Saul because the Father had Samuel pour oil upon his head and proclaimed him king. He knew who anointed men. Can you imagine fearing the Father so much that you would be convicted that you cut off a garment from a man who was chasing you with the hounds of hell at your heels? This man David has already been anointed by Samuel. He already knows the Father has chosen him as the future King of Israel. He has even been given the favor of man and knitted his heart with the king’s son Jonathan, and yet, he never boast in his calling. He never wishes harm on his enemies. He is given opportunities to destroy his enemies time after time and stands in his integrity, fearing the One greater than any fleshly king. How do we view our enemies? When we have a chance to destroy them with our tongues, do we feel such conviction? “Behold, this day your eyes have seen that the LORD had given you today into my hand in the cave, and some said to kill you, but my eye had pity (Compassion) on you; and I said, ‘I will not stretch out my hand against my lord, for he is the LORD’S anointed” (1 Samuel 24:10). Do our eyes have compassion for our enemies? The same compassion the Father had for us when we were in need of mercy? Do we fear to stretch out our hands or our tongues against them? Saul weeps. Saul repents—sort of. Have you ever caught a child in the cookie jar? They really aren’t sorry, just sorry they’ve been caught. Saul even explains that he knows David will be king over all Israel. So why doesn’t he just take the crown off his head and hand it over? Why does he want to hold on to his pride and weak power? Even with a whole army of thousands, he cannot prevail over David because the Father is with David but has left him. What a fearful place to be in. A place where you continue going through the motions wearing the armor, the robe, the signet ring with no power or favor from Adonai. A man or woman in this condition is like a dead tree, twice uprooted and without fruit. Most are familiar with David’s cry. A Psalm of David, when Nathan the prophet came to him, after he had gone into Bathsheba and committed adultery. He had her husband put on the front lines in order to be put to death. He tried to cover his sin. We do this too. But David listened to Nathan and he wept and said, “Do not cast me away from Your presence And do not take Your Holy Spirit from me” (Psalm 51:11 NASB). I believe David had looked on a man (Saul) who the Set-Apart Spirit had left, and he watched that man, King Saul, trying to grasp hold of a kingdom he had already lost while seeking a God who no longer answered him. David feared the condition of what he had seen. He remembered back and cried from a deep place due to his own sins. Who do you think the Father is more merciful with? Those who give mercy. “Blessed are the merciful, for they shall receive mercy” (Matthew 5:7 NASB). As we approach the Day of Atonement let us be merciful to our enemies as the Father has been merciful to us. Again, I have run too long and will not be able to finish this series without a couple more entries. In our next portion (Part VI HERE), keeping with the Ten Days, we will examine a man named Nabal and his heart that turned to stone in ten days. Some real questions that we must ask of self. Great how you set them up at points along the story! A pointed finger always has three pointing back at self….the call of Father to keep asking Him, seeking Him, knocking on His door….oh we do fool ourselves and we surely need Him to show us what we have buried deep so we no longer feel His convicting Spirit. Praise Him for seasons and the corporate call is so real. May we know family and friends who hear and start on His ancient paths. Then the part where David has compassion on a set-apart man in desperation yet still covering self from pride. I just saw that picture you painted so well. We have no stronghold but broken and contrite before our King. May He cover our nakedness!! Yom Kippurim….day of coverings…..what a mouthful! thanks for this continuation of a tale well told. I always think during this season that I am still not awake enough. That I need to be thinking about this day all year before I open my mouth. So many mistakes along the way but His mercies are made new each morning. He is faithful! Oh, how He loves us!!! A righteous man may fall seven times but we get back up and the Father helps us. You mentioned something in one of these blogs about connecting naked Saul and David covering him. It was such an amazing post but I can’t seem to find it now. Did you ever get through deliverance? Have you ever been delivered (had demons cast out of you) at any time in your life? Most Christians do not believe they need this. But, rest assured, 99.9% of believers desperately need this, whether they know it or not; and most will say that Christians can’t be possessed. Jesus said, “Deliverance is the children’s bread.” And what is the one miraculous work Jesus did for the people of the New Testament more than any other? He cast demons out of people, and healed them. God bless you.